Click here for printable supply list. 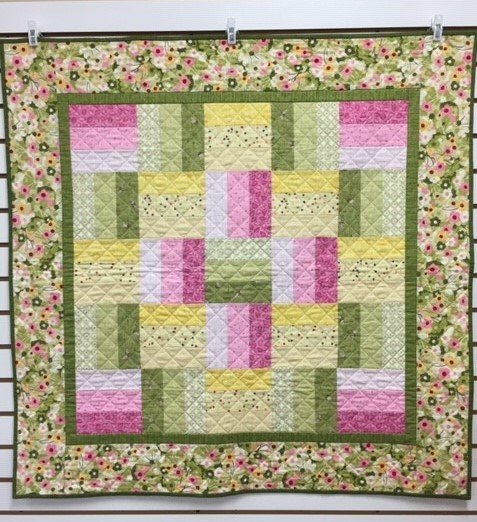 Learn the basics of quilting while making this Rail Fence Quilt (finishes approximately 41 1/2" square). Great for a lap quilt, baby quilt, or wall hanging. We will help you choose fabrics to make your quilt uniquely your own. Students will learn how to: use a rotary cutter, tips for accurate seam allowances, add borders, layer and pin baste the quilt, quilt with a walking foot, and apply the quilt binding. Instruction time is 3 hours each session. You may stay afterwards and continue to work if you'd like. Book and fabric purchase required. Bring your sewing machine. Sewing machine in good working order. Book and fabric purchase required. Supply list furnished upon enrollment.